Public Transport to Save the Planet: Get on the Bus! Perhaps many of us have a love-hate relationship with public transportation? Waiting for buses and delayed train schedules can certainly be frustrating, but choosing public transport whenever possible is a great step to take for the planet and your bank account. 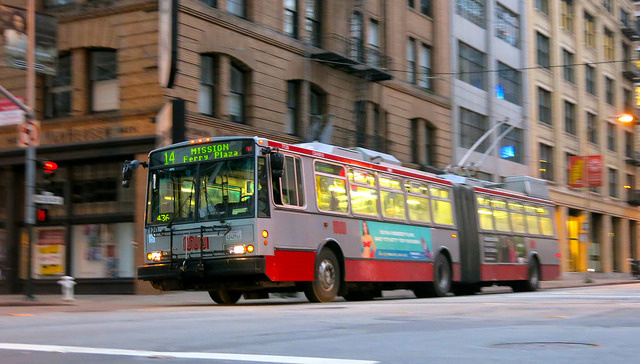 How much of a difference can public transportation make on your carbon footprint? Almost a third of our nation’s footprint is guzzled by the transportation sector. Of that chunk, individual vehicles are responsible for 64%! This means that changing the way you move around town is one of the quickest ways to cut your footprint down to a manageable size. The American Public Transportation Association estimates that one person can reduce his daily carbon emissions by 20 pounds, or more than 4,800 pounds a year, just by switching from driving to public transit; this translates to 10% of the entire household’s emissions. If you can’t get on the bus or train, carpooling is another great option that saves you money and time while dropping your emissions impact significantly. Which forms of transit are the best for the planet? The US Department of Transportation calculates that heavy rail transit, like metros and subways, produce roughly 75% less in greenhouse gas emissions per passenger-mile than single-occupancy vehicles, while light rail systems produce 57% less, and bus transit 32% less. Researchers at the University of California at Berkeley also conducted a full life-cycle assessment for public transit and found that even when taking into account emissions from infrastructure, manufacturing, and upkeep, public transportation still provides consumers a greener option. Innovations in hybrid or renewable technology continues to make public transport ever greener, giving us more reasons than ever to ditch the car whenever possible. As an added feel-good bonus, public transportation has also been shown to help conserve land, reduce travel time, and spur economic development. Since public transit eliminates the need for large parking lots and highways, businesses can be closer together, helping to reduce travel time between destinations. Instead of being chopped up by ugly freeways, public transportation helps create more close-knit communities where people are more comfortable traveling on foot or on bicycles. Foot traffic is instrumental in the success of small retail and food spots, so next time you have the choice to take the bus, remember that you’re helping support the local economy thrive on various levels. Perhaps most importantly to many of us, taking the rail, bus, or ferry can also make a huge positive change for your budget. Vehicle maintenance, parking, and fuel costs add up quickly. See how much money you could save by using public transportation with the APTA’s Fuel Savings Calculator. One writer on Treehugger shares how he has saved about $10,000 each year by using public transport. Even though public transit may require a little extra time and planning, it has the big potential to save you some serious cash for more organic food, sustainable wine or gadgets.